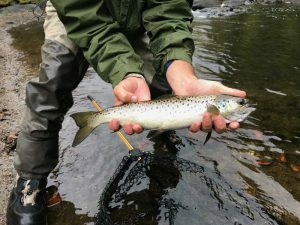 We had been blessed with cool temperatures and great rain all summer long which helped bring some early runs of fish into salmon tributaries across the state and New England. 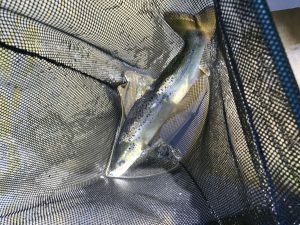 Even though I saw or caught fish in August and early September the hot weather thru September eventually slowed things down, and in some waters shut it off completely. Small 17″ fish landed September 2nd, 2017. Only a few fish were in the river that day but they were all hungry that day. Fish have been present throughout the period and in the last week numbers are growing. Rains today should get the last of the fish holding in the lakes to come in and give us another month of good fishing. Some systems might fish well into late November where regulations allow. The water has been very low and clear which makes getting them to hit even that much more difficult. Stealth approaches can help and presentations must be perfect. Simple trout tactics will get you hooked up on smaller salmon and chrome bright freshies from the lake. But, low water fish who have been in river for a while get smart. They’ve seen tons of hooks, reject most offerings, or take up lies in complicated currents that not even a physicist could explain. 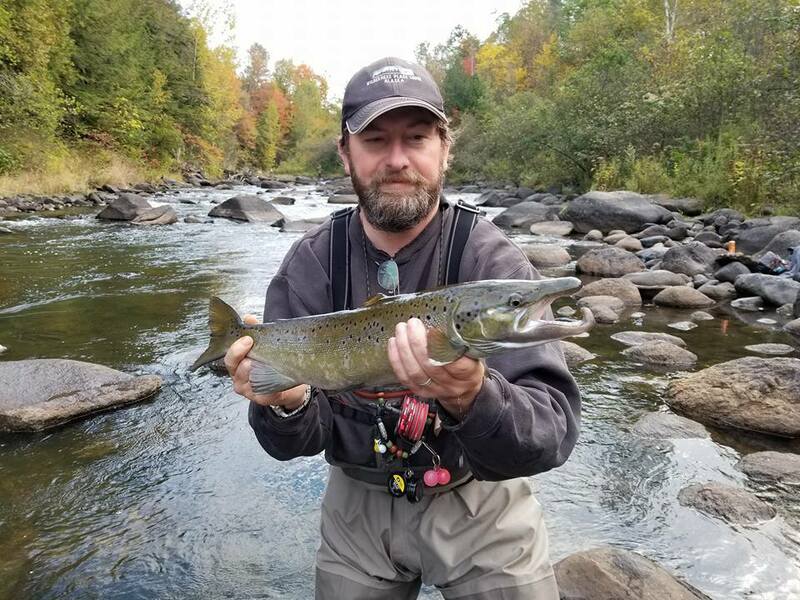 Another 17″ class fish landed on Oct. 7th, 2017. Patrick Barone, from Charter the Berkshires, came up this past weekend and I was able to help him get oriented to these fish. Fat 24″ 6lb class chrome bright female landed Oct 8th, 2017. She just appeared in the tail of the pool that we were fishing. Resting after ascending rapids below she was looking for a snack and exploded on a wet fly and proceeded to cartwheel across the river and into a boulder pile after realizing that wasn’t a real piece of food. Can’t believe she didn’t knock herself out or break the line for that matter. This tarnished 22″er was laying in the middle of a deep slow slot, under fast current. Ben Brunt from from Boston, MA and I saw it actively feeding but we could not find the right drift line or presentation to get a strike. Eventually we figured out the drift and then it was just couple fly pattern changes to find something it wanted to eat. Hooking up takes patience, focus, and perseverance to decipher holding lies, drift lanes, and whether fish are feeding. Large 29″ 9lb female from a few years back is my personal best. 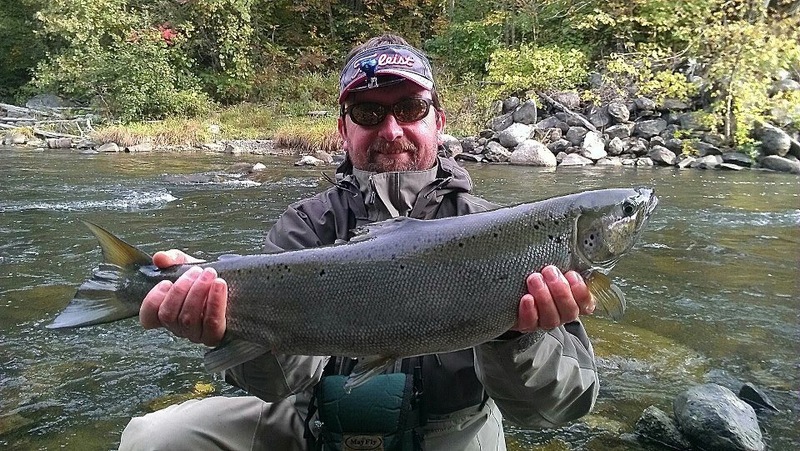 Give us a call today and book a trip to fish Landlocked Salmon and other species this fall. 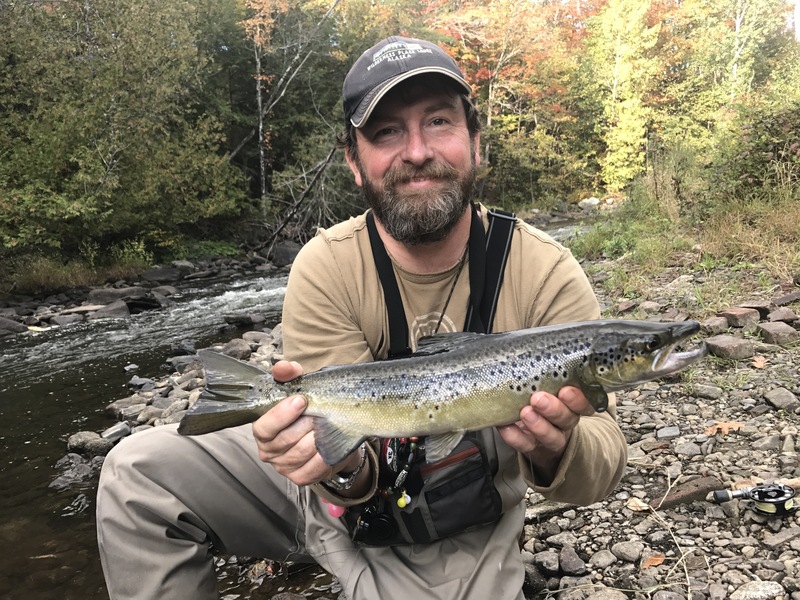 Lots of good opportunities from Central to Northern VT for salmon and lake trout, and big brown trout abound this time of year across the entire state. 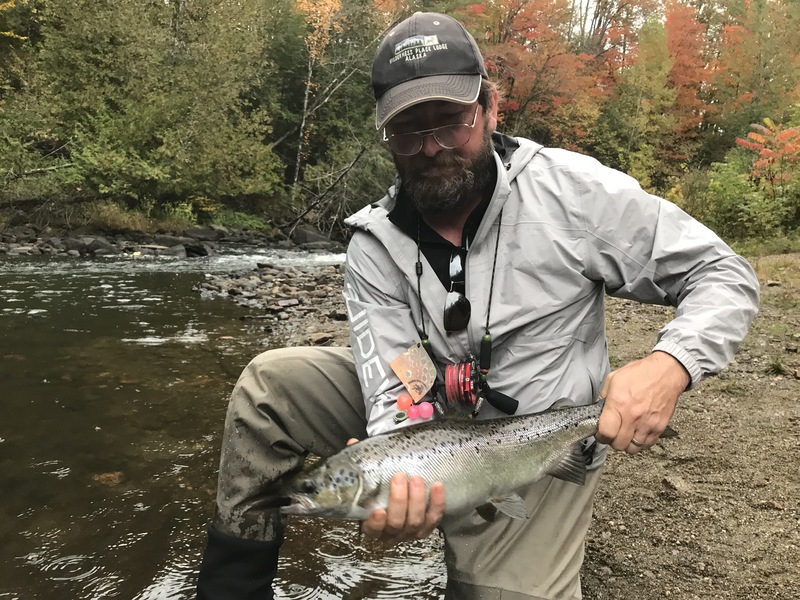 Previous River Report 10/7/17Next Very Busy, for good reason.